We play several cool, local, affordable shows this month. 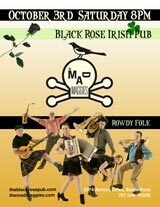 So put on your dancing shoes and step on out to hear some crazy live music. October 4 – Sunday 4PM – Castro Street Fair, San Francisco — donation at the gates. You’ll find us at Max Barnaby’s World of Wonderment on 18th Street, between Hartford and Noe. 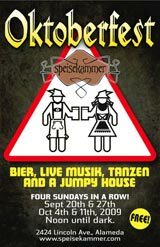 October 11 – Sunday 2-6PM – Oktoberfest at Speisekammer Restaurant, Alameda — No Cover. Best schnitzel, best German beer selection. October 16 – Friday night – Sleeping Lady Cafe, Fairfax. 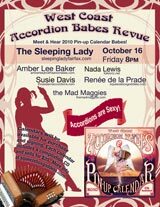 An "Accordion Babes Revue". Line-up includes: Amber Lee, Susie Davis with some of Those Darn Accordions, Nada Lewis and Renée de La Prade. We’ll have calendars for sale and signing. And this just so happens to be my birthday. Hurray! Another revolution around the Sun. October 17 – Saturday late afternoon – Music in the Plaza, San Rafael — Free.